Do you find that your preschool-aged child is lightning fast with those computer games and tablet apps? Amazing, huh? We sure didn’t know how to do that way back when… Why not take advantage of your little computer genius’ technology proficiency by offering educational apps and games for him to play? And he can improve his speech and communication skills at the same time. Parents and teachers both can utilize the educational games, activities, and videos that support learning goals for kids at all levels. There are many apps and online resources available for your preschooler and we’ve taken the guessing game out of which ones work well. 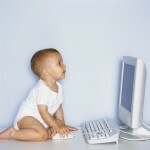 A benefit of online speech therapy is that it does not feel like “therapy” or “work” for your child. While playing games, he can improve articulation, increase reading skills and engage his brain while being entertained and amused. Online speech therapy can be done anywhere, at anytime! If you don’t have access to a tablet or computer at home, try the local library. If you are on a long car road trip, instead of watching a DVD of Dora the Explorer for the 20th time, encourage your child to use your iPad, tablet or smart phone to fill the time with speech therapy activities. Screen time gets a bad rap sometimes, and doesn’t necessarily mean that it is a negative distraction for our kids. Instead, these apps, games and activities can be effective teaching tools and a good resource for online speech therapy. Turtle Diary -This site is divided by different grade levels and has free and fun games for children of all ages. Preschoolers can play Phonic Train or Picture Sequencing to build language skills. While some of the games require a membership to play, there are many that you can access without joining. Who knows? If your child loves what he’s doing, you may consider joining for more options. Scholastic: The Scholastic name has been around for more than 90 years, delivering some of the best magazines, books and educational programs to children and schools. There is a variety of games, books, activities and online puzzles designed for preschool and school-age children and their parents. This site also includes many games and activities for children related to popular characters and children’s books such as Clifford, The Magic School Bus, Walter Wick, and I Spy. Starfall: Starfall is a free, phonics-based reading website. The comprehensive site offers a strong foundation for preschool-aged kids, and those children who are getting ready to enter school for the first time. Your child can choose activities in reading, math, science, vocabulary and more! Teachers also benefit from this site, as it provides resources and ideas for teaching curriculum. Speech Buddies University – Of course, we must share our terrific site with you! Speech Buddies University is like an online speech school! Our free site offers online access to customized word games, and students can track their progress on a simple dashboard. The site offers a range of levels from beginner to advanced, and can be used as an effective supplement to current speech therapy treatments. What are some of your favorite online sites and resources? We love to hear your ideas about what online speech therapy sites and activities your family enjoys!